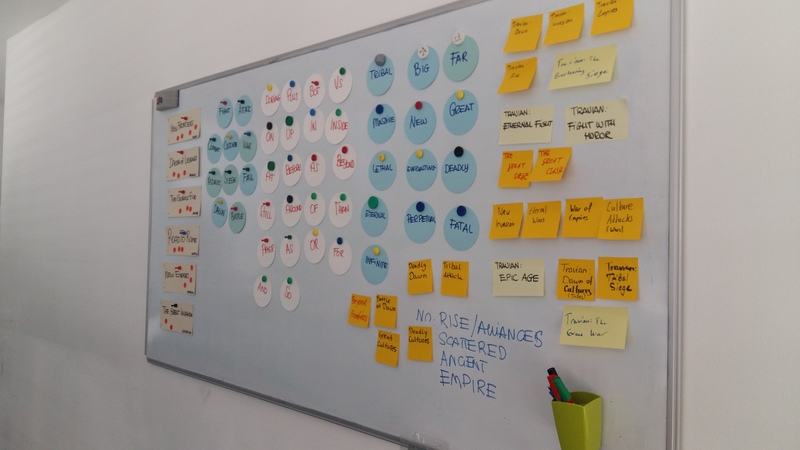 First of all, I’d like to introduce myself to you; I have been writing the Dev Diaries for quite a number of weeks now and you have no idea who I am. My name is Martina and I’m the Community Communications Manager for Travian: Legends. I work really close to Martin, who’s the Brand Manager for Legends (you might have seen him in some of our videos). I was hired in March and I’m pretty sure that no one considered the funny thing about hiring me (Martin and Martina, it looks almost like a TV comedy duo). Anyway, let’s return to our topic. The name. 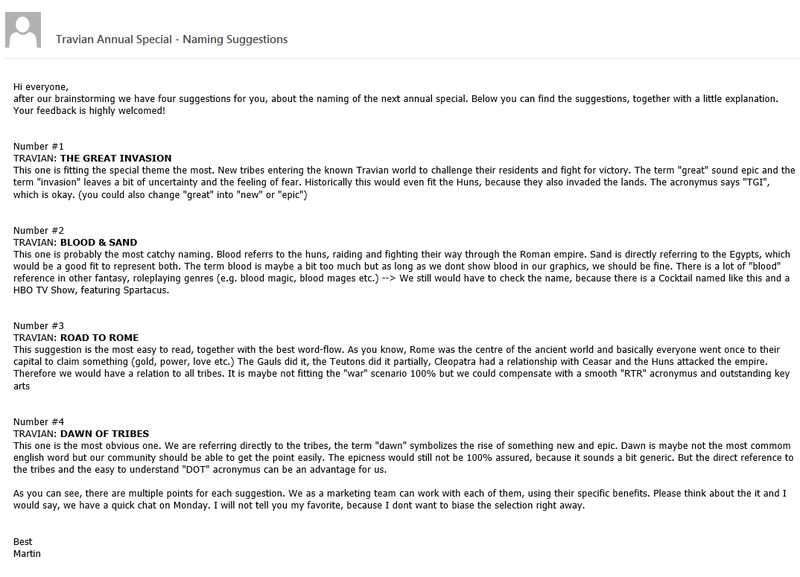 When the time came to find a name for this year’s annual special, Martin and I brainstormed and decided that we wanted to have the most feedback possible within the company, which would mean we wouldn’t miss any creative names. 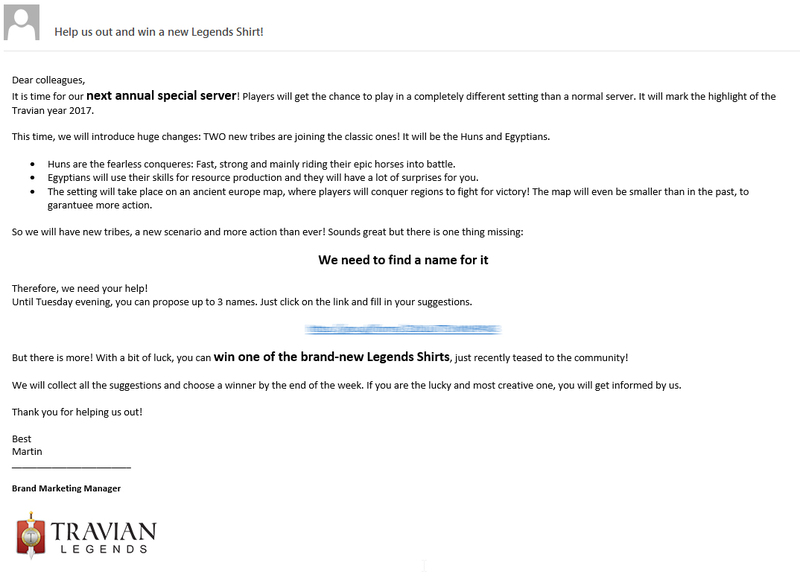 We decided to organize a little contest within the company and, since it was about the time when we released the #AskTravian video and everybody (including in the company) saw those amazing red t-shirts, we set a t-shirt as the prize for whoever proposed the name that we chose in the end. This was a real blast; we sent the email to around 170 people, but we were not expecting many answers at all. Could you imagine someone from the accounting department, who is normally used to whispering numbers, sending us a creative name? I couldn’t. We received 66 suggestions for the annual special name, wow! 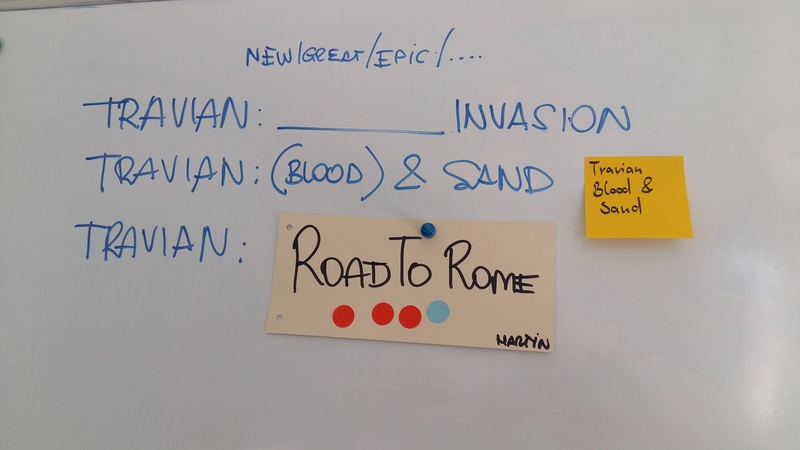 The next step was easy; we needed to discard the suggestions that were not suitable for one reason or another (we received a suggestion to call it “Game of Tribes”, I’m pretty sure that none of you would be able to search on the Internet for Travian: GoT and actually find something about Travian…). 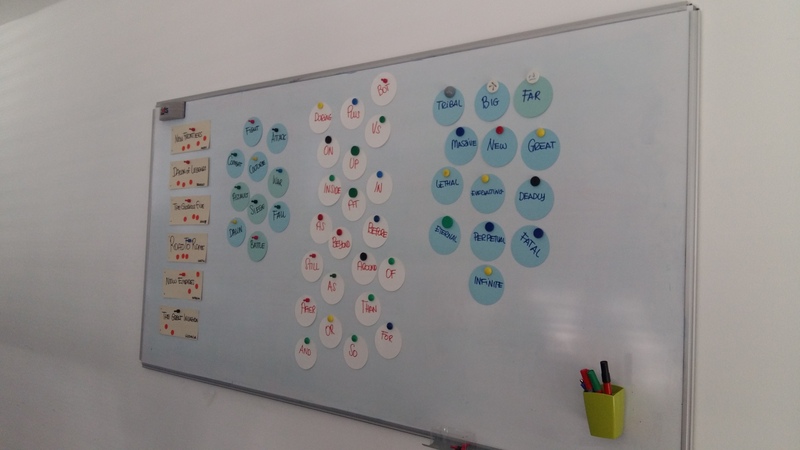 After the first selection round, we decided to organize a brainstorming meeting. 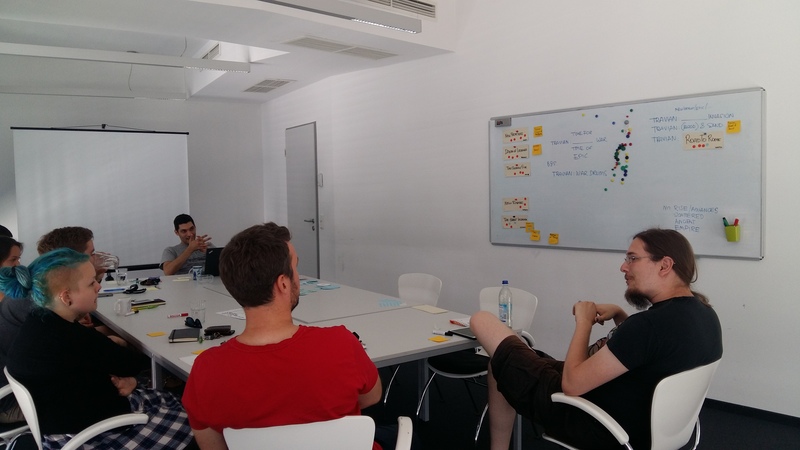 We invited a marketing expert, social media expert, game design expert and the video producer. We were 8 people altogether. The brainstorming session lasted 1 hour and 30 minutes and we had 3 finalists on the short-list. 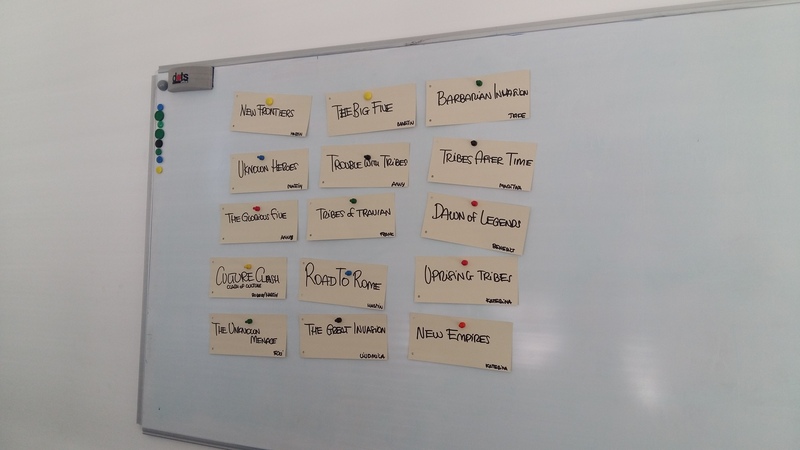 The first thing we did was to hang all the short-listed names on the whiteboard. Do you notice anything? Well yeah, “Fire and Sand” isn’t among them. Just wait, more fun is coming. 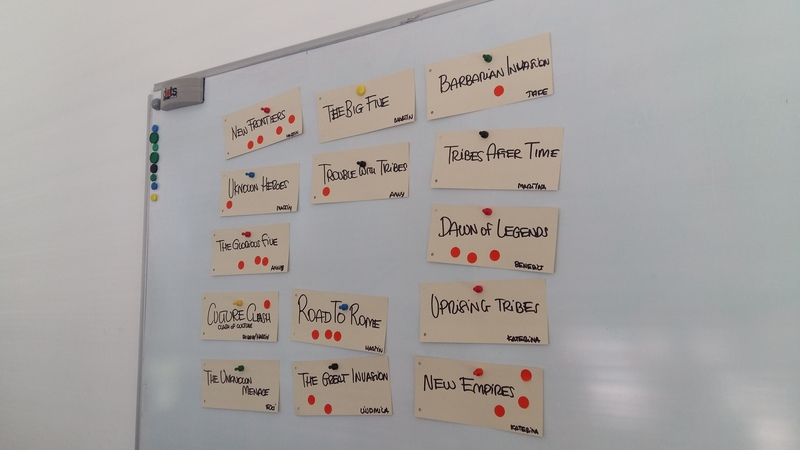 Everybody in the brainstorming team was given some sticky red dots and they could put up to 3 dots on their favorites (no double voting allowed). At this point, we discarded all the names that no one liked. And we brainstormed even more, trying to come up with additional names. To facilitate this, I created some additional labels with fitting words, prepositions and adjectives. We came up with an extra 23 names, and we went for another round of voting. After this round, there were 4 names left. And we were all excited as well as a bit exhausted. Again, you’ll see “Fire and Sand” is not there. More fun to come! What were the next steps after having 3 short-listed names? We needed approval for them from the Game Center. Martin wrote a nice email to the Game Center with the necessary explanation on why these names had been chosen. I was excited to use “Blood & Sand” and when the Game Center gives us their blessing for the 4 suggestions, we moved onto the next step: contacting our legal department to have the name checked. The legal department checked the names for possible copyright infringements and any other types of legal issues. And here it comes! The legal department vetoed ALL the names! I have no picture for this, but maybe a meme could be better for showing you what mine and Martin’s face looked like when we received the veto! It was something between hysterical laughing, a panic attack and pure terror! There was not much time left; we needed a name! We informed the Game Center about the issue and we started a little brainstorming and research again. We wanted something to fit both tribes and, at the same time, it had to be epic. After all, this was one of the coolest annual specials we’ve ever had; we wanted it to be impressive. Following one suggestion and another, we sent more names to the legal department and we got another “NOPE”. And then, Brian, the magic Brian, Lead Product Management & Design, sent us an email, suggesting “Fire and Sand”! Just in time! We have the name! With the name chosen, the art team could start creating the logo and the marketing team could prepare the communication for this amazing annual special. Are you ready? The closed beta server starts next week; have you already received your key? Or are you planning to put all your effort into the national server that will open starting from September? I hope you enjoyed the Dev Diary series!